The Fusine cliff saw its first bolt in the far 1992, hand-planted by Matteo Crottogini on the Via Luna, then called Prua. They were only two bolts, but they started the cliff revolution. Spark and friends they then continued to nail the cliff over the years but. Initially it was not very popular because there was around the rumor that the cliff was very technical and difficult cliffs and consequently caused fear and was not chosen. With the passage of time and the rise of the average level Fusine's crag began to fill with climbers and today is very popular especially in the summer, given the proximity of the stream. Currently there are about 50 itineraries and the difficulties are between 6a and 8b +, with lengths ranging from 8 to 25 meters. 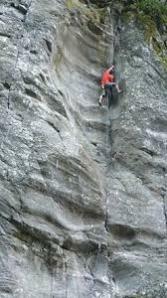 In Fusine you can climb in complete tranquility and in the cool ... good climbing! Climbing at Fusine is very technical and varies from slightly overhanging to strong strapimbo, the type of rock and a gneiss with different processing from sector to sector. Climbing requires a good technical level (medium - medium high). From Lecco take the SS36 northwards, then the SS38 to enter Valtellina. Reach Morbegno and continue towards Sondrio. In the vicinity of Berbenno leave the car on the left side of the road along the Madrasco torrent. Reach the crag on foot in 1 minute.